Burnside Denture Clinic is conveniently located at 160 Burnside Road East – this location is wheelchair accessible. Kent’s father was a Denturist, Kent’s Brother is a Denturist, Kent trained his 2 nephews who are Denturists and purchased his clinic in Saskatoon, which he successfully ran for 9 yrs before heading west! 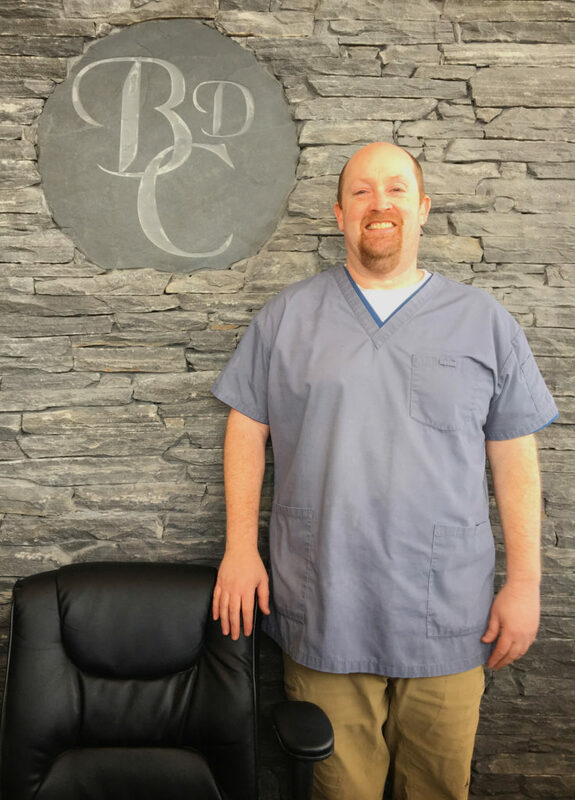 He starting working at his father’s clinic at the age of twelve, during summer holidays, and went straight into the Denturist program at The Northern Alberta Institute of Technology at the age of 18, graduating in 1995. He has been licensed as a Denturist since 1997. With this experience Kent is known for his quality workmanship and high standards. We like to treat our patients at Burnside Denture Clinic just like our own family and we make sure each of them feels relaxed, at ease and at home!! Kent’s new Denture care team is looking forward to hearing from you. Since 1981 our patients have come to expect only the very best in professional care, workmanship and attention to detail. we work with, and refer to, fourteen of the very best dental specialists in the greater victoria area. Dentist Consultations and Extractions Arranged, on Request Complete, Immediate and Partial Dentures (False Teeth) Implants, Overdentures, Mouthguards and Soft Liners Relines, Rebases, Alterations & Reconstruction Treatment Plans. What are my dentures made of? The most common denture base material is a special formed acrylic plastic. Into this are set the artificial teeth of the selected size, shape and colour to conform with your personal characteristics. How long do my dentures last? Ordinary toothpaste is abrasive and can wear away dentures. Brush your dentures with a soft toothbrush. Do not use bleach on dentures as it will weaken the teeth. An excellent way to clean your dentures safely and effectively is with a soak with an effervescent tablet. Then use Sunlight dish washing detergent. If you experience tender or sore jaw muscles, difficulty in opening or closing your mouth, frequent headaches or a clicking or grinding noise when chewing or yawning, you may have TMD. It is more common in denture wearers than you think. What Can Be Done About TMD? Better extensions and fit of the denture borders. What Can The Patient Do About TMD? Avoid straining, clenching and grinding your jaw. Remember: lips together, lips apart. What Do I Do After Extractions? Bleeding Control: Apply pressure to the extraction site by biting on the gauze that was provided (for about one hour). Changing the gauze is not necessary, however if you do so, then dampen the gauze with water before placing it over the extraction sites. Don’t go home and lie down as the blood rushes to your head and it will take longer for the bleeding to stop. Remain upright for an hour while biting on the gauze. Smoking: Smoking delays healing and increases the chance of dry sockets (loss of the blood clot). Alcohol: Don’t drink alcohol for the next week as it expands the blood vessels and delays clotting. Preserving the blood clot: Do not disturb the socket for the next four days. Don’t drink through straws (you could dislodge the blood clot) and do not stick toothpicks or other objects into the socket. Rinsing: one teaspoon of salt in an eight ounce glass of warm water. Rinse your mouth gently six to eight times per day. Pain Control: Use the pain medication recommended by the Dentist. An ice pack applied to your face (20 minutes on, 20 minutes off) will help decrease the swelling. I took my mother to Burnside Denture Clinic. She had been putting off getting her teeth extracted and seeing a dentist for years just because of her fear of them. After seeing Kent a few times she felt comfortable. She actually went through with the extractions and got a new set of dentures made. I remember sitting in the waiting room, hearing her laughter and saying, “Is she actually laughing”? My mother had never wanted to see a dentist or denturist let alone could laugh with one. My mother is no longer afraid and it makes it a lot easier on both of us. Because Kent made my mom so happy, I decided to get a new partial denture as well! I highly recommend this clinic. I was having a lot of trouble with my denture staying in place and using a lot of denture adhesives. So i called Burnside Denture Clinic for a consultation and Mr. Roberts informed me about implants The implants did cost a pretty penny. With that being said I do not think of it as money wasted, every cent was worth it! My dentures snap right into place. They are easy to take out to clean as well. No more poly grip for me! My dentures are more stable and I’m eating things that i haven’t been able to for years! There is no more food getting stuck between my gums and teeth! Kent took good care of me and was always very polite. They really worked with me to get me the dentures as quickly as possible. I can honestly say that I will be going to Burnside Denture Clinic for my next set!